I wonder what their honeymoon was like! Did they tie the cans to the back of their bike? Where was the \'just married\' sign attached? I think this is my Mom\'s wedding! Was the picture shot at King Mountain on the Glenn Highway in June? If you\'re concerned about the environment and the gas they consumed for the sound off, you should consider that their motorcycles used considerably less fuel that most vehicles on the road. These folks love this state, they love the beauty, and they wanted to do this in a manner that honors that tradition. 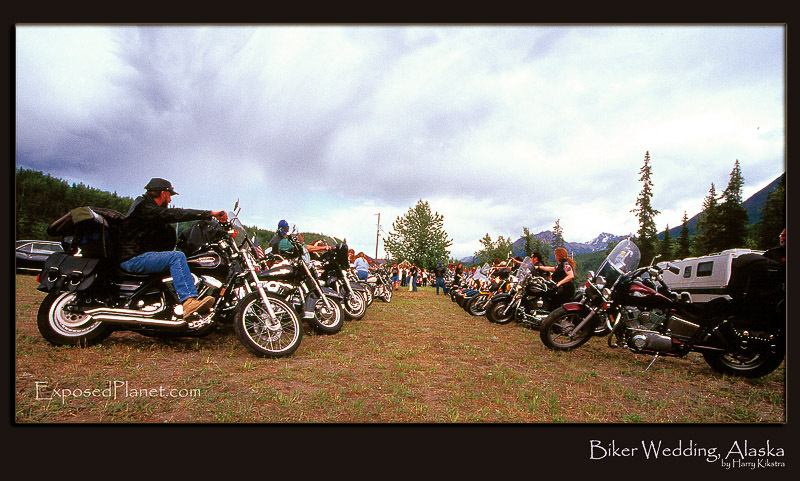 The story behind "Biker wedding, Alaska"
After climbing Denali we toured across the beautiful wide open state of Alaska. A bunch of motor cycles drew my attention and I pulled over to find a few dozen of aged Hells Angels who were performing a wedding ceremony. It was in the open and they did not seem to mind that we watched. At the end of the short speeches the newlyweds walked through this honorary line-up of motorcycles, while the riders pulled their gashandles creating a huge roar. On one hand a typical waste of fuel and pollution of the clean and silent environment, on the other hand a great sign of friendship from free-spirited people who enjoy the outdoors a lot.